Cassie: I love this piece, Charlie. Charlie: Yea? It was kinda stupid. Not very original. 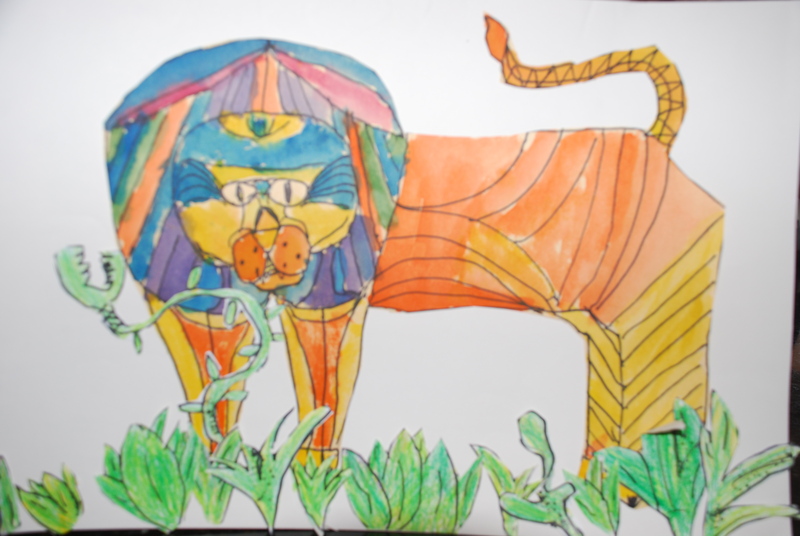 The art teacher gave us the lion shape – it was already outlined – and then we had to draw the line patterns and color it the way we wanted. I don’t know why we couldn’t just draw our own lions. Cassie: Lions can be tough to draw for a lot of artists, you know? The colors are great. Cassie: I see a Venus Flytrap. Did you draw that…on your own? Charlie: Yea. The only awesome part about the picture. Cassie: Do they even have Venus Flytrap plants in areas where lions live? Charlie: Who cares?! Sheesh! The Venus Flytrap makes the piece more my own. Don’t you get it?